An NBC California joint investigation found more than 2,500 stolen or lost guns were used in crimes between 2010 and 2015. Guns inside a California law enforcement storage room. Standing in the driveway to his home on Sacramento Street in Stockton, California, 13-year-old Rashawn Harris says goodbye to his daddy. Moments later bullets from a gun owned by Anthony Silva, the Mayor of Stockton, tear through his body, killing him instantly. Anthony Silva, the Mayor of Stockton, didn’t pull the trigger when Rashawn was killed last February. Police say they are still looking for who did. “My baby’s gone...ain’t nothin to be done,” said Willis Harris, Rashawn’s father. The gun used, a .40 caliber Beretta Px4 Storm semi-automatic pistol, belonged to Silva. It was reported stolen last March, after police say it was used to kill Rashawn and in one other shooting in January at a Stockton home. That time no one was injured. On a typical day, at least 34 guns are reported as lost or stolen in California. The daily toll adds up to a much bigger number. According to data from the California Department of Justice, nearly 70,000 firearms went missing or were stolen between 2010 and late 2015. In a joint investigation, NBC TV stations in California obtained trace data, including gun serial numbers, from 72 California law enforcement agencies. The serial numbers serve as unique identifiers for weapons, like a person’s social security number. An analysis comparing serial numbers in the California DOJ database with serial numbers in the 66,000 crime records obtained through the California Public Records Act found 4,346 matches. The data shows 2,655 of the guns reported lost or stolen were used in crimes ranging from murder to grand theft. Click here or look below to see how many guns were reported lost or stolen to California law enforcement agencies from 2010-2015. 84-year-old Olga Dinelli is one of those victims. “It was a senseless act of violence that just doesn’t make any sense,” said Larry Dinelli, Olga’s 74-year-old brother. Olga was found shot in the head last February, strapped to a chair with duct tape in her Sonoma County home, west of Napa. Olga Dinelli, 84, was found shot in the head in her home in Sonoma County California on Feb. 26, 2015. Police say Stephanie Lejean Hill, 37, and Victor Silva, 26, were on the run after stealing firearms from a Marin County home, just south of Sonoma. They shot and killed Olga before fleeing in a stolen car and leading police on a high speed chase that crossed state borders, ending in Arizona. Hill was shot and killed by police. Her boyfriend, Silva, was arrested and awaiting trial. 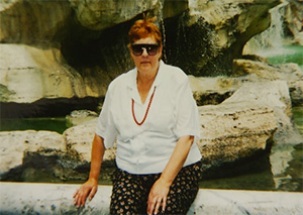 Police seized three stolen guns in connection to Olga’s death and the chase, but have not released information on the gun used to kill Olga. Larry says Olga would have given them anything they wanted. In October, police say, one gun, stolen from a parked car in San Francisco, was used to kill two people, days apart. Lokita Carter’s husband, 67-year-old Steve Carter, is one of those victims. “Having police stand outside at three in the morning saying, ‘We have some unfortunate news for you, your husband was shot dead a few miles away,’ was a bad nightmare,” Lokita says. Steve was a tantra yoga instructor. On Oct. 5, he was gunned down while walking his dog on a remote hiking trail in Marin County, police said. 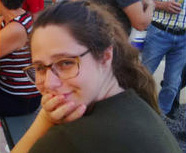 Two days before, 23-year-old Audrey Carey, visiting San Francisco’s Golden Gate Park from Canada, was found dead with a gunshot wound to the back of the head. Police say the same stolen gun was used to kill Steve and Audrey. 23-year-old Audrey Carey was shot in the head and kill with a stolen gun while visiting San Francisco’s Golden Gate Park on October 3, 2015. Three transients were arrested in Portland in connection with their deaths: Sean Michael Angold, 24, Morrison Haze Lampley, 23, and Lila Scott Alligood, 18. Data shows the vast majority of the nearly 70,000 guns in the database were reported stolen, not lost. Through public records requests, NBC was able to link 750 of the stolen guns to police reports to help determine how they were stolen. According to the analysis, nearly 550 of them were taken in burglaries, close to 200 were taken in simple thefts and a handful were stolen in face-to-face robberies. Click here to read more on how the data was analyzed and how agencies across the state responded. Stockton Police Chief Eric Jones says he isn’t. He says firearms have a long shelf life and suspects the numbers are actually a lot higher. Click here to see how stolen guns are impacting the Bay Area. Barlowe and other law enforcement leaders say they agree. “I think there’s even more,” he says. According to Barlowe, many gun owners don’t immediately notice or fail to report when a gun is missing or stolen, sometimes waiting months or even years. This was the case for Silva, the mayor of Stockton. Shortly before his run for mayor in 2012, Silva moved from Morada, northeast of Stockton, to a new home within the Stockton city limits. He says he didn’t take his guns with him; they were left behind in the Morada home. On March 22, 2015, Mayor Silva reported the Beretta semi-automatic pistol missing to the San Joaquin Sheriff’s Department. Other items were also reported missing, including a generator, a camera and a 100-quart cooler. Almost a year and a half later, the Beretta pistol was found. Stockton Police officers collected the pistol as evidence two months ago, on June 9, after responding to a domestic disturbance in Northern Stockton. The serial number on the weapon matched the same one registered to and reported missing by Silva. After conducting preliminary tests, police traced the ballistics to the shooting death of 13-year-old Rashawn and the January 2015 shooting where no one was injured. Click here to read more on the timeline of the loss of the Beretta pistol. “Words cannot describe my sorrow and heartbreak for the victim and his family,” Mayor Silva said in a statement. “I feel terrible and I feel sick to my stomach. Obviously this was my worst possible fear. I will be in shock for a long time.” Click here to read his complete statement. Click here or look below to learn more about stolen guns being used in homicides in California, including where they were reported stolen and how long they were missing. Evin Johnson grew up around gang violence and guns in Sacramento. Even as a youngster Johnson says he knew how to buy a gun off the street. According to California DOJ data, Evin’s hometown is a hotspot for stolen guns. The Central Valley is second behind the Los Angeles area in lost or stolen guns, according to the data analysis. Click here to see how stolen guns are impacting the Sacramento area. The NBC data analysis shows several stolen guns are used two or three times in two or three different crimes. Barlowe says this doesn’t surprise him. Most of the time, according to the data, when a weapon is reported missing or stolen, it’s found in the same region where it was lost or stolen with many flowing between Los Angeles and San Diego counties in Southern California and between San Joaquin and Madera counties in the Central Valley. Barlowe says his experience has shown that a county's proximity to the U.S.-Mexico border can increase the number of firearms reported stolen. Some do move long distances though, according to the data, particularly from rural counties to urban areas. This includes weapons reported missing or stolen in Lake County, three hours north of San Francisco. Guns stolen or missing in Lake are showing up in Riverside and San Diego counties, according to the data. Once they go missing, the data shows guns stay that way for months or years. The typical wait from when a gun is reported lost or stolen and when police seize it is 227 days -- a little longer than seven months. According to the data, in a quarter of the cases, guns are in the wrong hands for 600 days or more. Barlowe says ATF sees similar trends and keeps track of them. “It tends to be very situational depending on the criminal organizations and depending on the success of the criminal organizations,” he said. ATF uses trace data, he says, to determine the story of how every gun has been used. Jones says standardizing this information and the databases is critical. “We are seeing gaps between the way we track them federally as well as statewide and jurisdiction to jurisdiction,” he said. Since 2004 federal legislation has prohibited ATF from sharing information tracing individual guns to crime scenes with the public. Many California law enforcement agencies, including some of the largest in California, Los Angeles Police Department and Los Angeles Sheriff’s Department, refused to share the requested data with NBC. The agencies cited investigatory exemptions in the state public record act. Jones agrees and says keeping stolen or lost guns from getting into the wrong hands will take time. This story was a joint collaboration between NBC 7 Investigates, NBC Bay Area Investigates, KCRA 3 Investigates, NBC 4 I-Team and KSEE. The following journalists contributed to the story: Stephen Stock, Michael Bott, Ron Campbell, Lynn Walsh, Mari Payton, Jay Yoo, Dave Manoucheri, Matthew Glasser, Chad McCollum and Felipe Escamilla.